In 2015, the Panthers led the league in interceptions and overall turnovers – the secondary consisting of Josh Norman, Kurt Coleman and “Peanut” Tillman, among others, dubbed themselves ‘Thieves Avenue’ and the nickname has persisted ever since – even though none of those players from the defensive backfield are still on the team and the defense only managed 10 interceptions in 2017, anytime the Panthers forced a turnover, the ‘Thieves Ave’ moniker would resurface, whether it was deserved or not. With six interceptions in the past two games – four from the secondary – the Panthers might just be earning that nickname back. 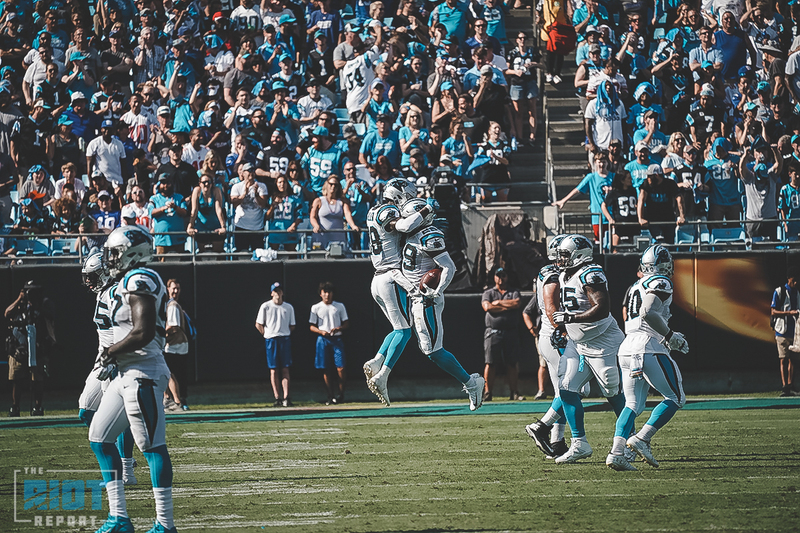 They certainly are – the Panthers have the second-most interceptions in the NFL since 2015 – and have gotten off to a quick start, aided by Jackson’s league-leading three interceptions; they got some help today from Mike Adams, who the team has multiple nicknames for, all of which revolve around the safety’s age: Old School, Pops, OG. Call him whatever you want, he’s producing. Adams had the fifth multi-interception game of his career against the Giants as he grabbed two interceptions – his third quarter pick in the Giants red zone led directly to a Panthers touchdown that put the team up two scores; the Giants tried to run a run-pass option that they had run in the first half and Adams recognized it, jumped in front of Odell Beckham, Jr. and put the Panthers in a position to score. It’s something he’s been doing his entire career; the 37-year old safety leads all active players in career takeaways with 29 interceptions and 16 fumble recoveries. Adams said he had some help in the form of the Panthers most recent acquisition, safety Eric Reid – Adams said after the game that there were certain plays were it appeared the Giants may have shied away from throwing it in Reid’s direction. 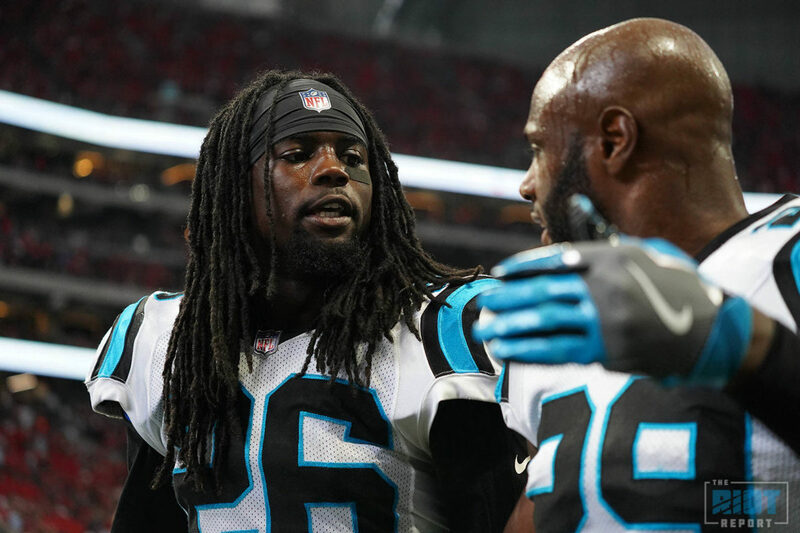 That’s just how Mike Adams has operated his entire career – he says the secondary in Carolina is a blue collar group that doesn’t care about accolades or being in the top tier of defensive backfields in the league, they’ll just continue to do what needs to be done to get the win. Even though the Panthers know they haven’t played their best ball over the past two games – Luke Kuechly described it after the game as ‘alright’ and the Bengals and Giants put up over 700 yards passing combined against the Panthers defense – it’s been timely turnovers and big plays that have helped the defense when they needed stops.  The Panthers have held their opponents to 4-of-17 on third down over the course of those games and have amassed six interceptions – and won both games. The Panthers have faced off with three of the best receivers in the league over the past month in AJ Green, Julio Jones and Odell Beckham, Jr – after limiting Green and Jones, they were unable to contain Beckham, who was able to rack up eight catches for 131 and a touchdown, in addition to tossing a long bomb to running back Saquon Barkley in the second quarter – a play that kept the Giants within striking distance when it looked as if the Panthers were going to pull away and turn the game into a blowout after going up 17-3. While the media – ourselves included – have painted the Panthers, and #1 cornerback James Bradberry in particular, as facing off with a gauntlet of top receivers to start the season, that’s not how they’ve pictured it – in their minds, they’re part of a gauntlet for receivers lining up against them. I’m openly wondering how long our linebackers are going to get a pass from the fan base. Sometimes name recognition can cloud fans’ overall reactions to a team and where they are at and I feel like this is happening in Carolina right now. Let’s get brutally honest. Our linebackers are playing very average football right now. Kuechly may still be our best LB, but he has not played up to his potential thus year. Lots of missed tackles and playing out of position. His stats right now are very underwhelming. And Shaq Thompson is playing at an even lower level. His Stat line says he had two tackles yesterday. TWO! That is a number that suggests Thompson was nowhere near the ball all game. Those crossing routes that the Giants killed us with yesterday are the same areas that Boyd and Ridley killed us. This isn’t just on the nickel back. The Linebackers need to play so much better.